We offer tailor made workshops for school groups from Key Stages 2 – 5 which are currently free of charge. We have bookable slots on Thursday and Friday mornings between 9.30 – 11.30 (sessions last one hour). Sessions take place in the magical book-lined Outer Library which houses the majority of the Institution’s historic collection. For larger groups we also make use of the nearby Pearson Education Studio at Exeter Cathedral. 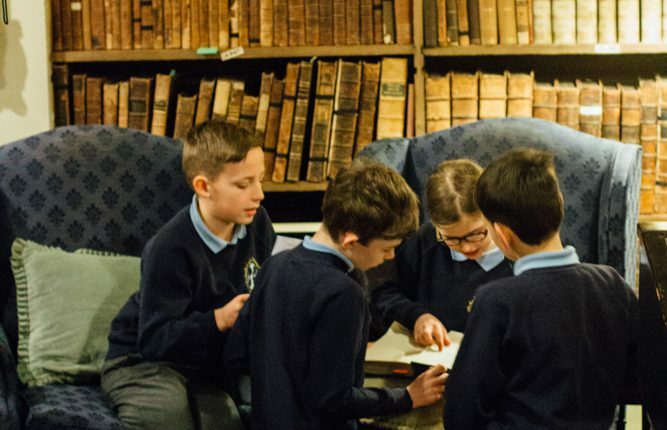 Our extensive book collection can be used to support and enrich the National Curriculum. All sessions are led by an experienced team of Heritage Educationalists and Librarians. Please contact Emma Dunn, Programme Manager the via email to enquire about a booking. Find out about Evolution, Natural History and Darwinism. Find our about The Age of Enlightenment and the influence of the classical world. Explore street maps, population growth and Victorian newspapers. Find out about Wartime Exeter, bomb damage and contemporary accounts. Discover the DEI Museum and the origins of RAMM. Explore the Age of Enlightenment, celebrity scientists and the origins of physical science. Find out how we conserve our collection and get ‘hands on’ with our preservation work. Explore our Victorian Christmas collection. Please contact Emma Dunn, Programme Manager via email to discuss your requirements.